#Interview With Dominik Marcel Kirtaime! Dominik Marcel Kirtaime is here with us, today. Dominik, will you please tell us about yourself and how many books you have written.? D: My name is Dominik Marcel Kirtaime and I was raised in Bristol, England. After my military career, I decided to stay and live in Germany with my family. As a child, I wanted to be a writer and enjoyed storytelling. When the opportunity knocked to become an indie author and publisher, I just had to grab the ropes and make my childhood dream come true - pen went to paper and fingers to the computer keyboard. Me: Sounds like you've had an eventful life, so far. Congratulations on achieving your dream. :-) What's the name of your latest book and what inspired it? D: The Perennial Migration. 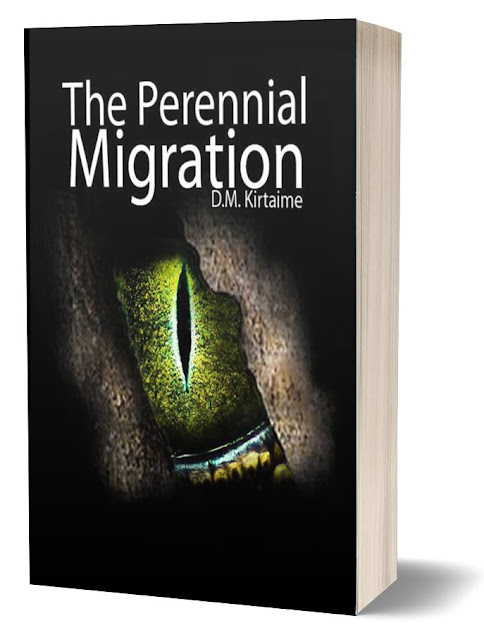 The story was inspired by the reptilian conspiracy and being fascinated by trees. Me: Ha! I have to admit, that's quite an introduction. What are you working on now? D: A sequel to The Perennial Migration. Me: Cool! Series are always fun. What authors, or books, have influenced you? D: James Herbert, Stephen King and Dean Koontz. Me: Ah, only the classics, then. ;-) What are you reading now? D: I am reading Phantoms & Monsters: Unexplained Encounters. On Goodreads I always post what I am currently reading. A rating and review is posted once each book is finished. Me: I'm sure the authors appreciate that; as I'm sure you know, reviews are our lifeblood, after all. For those who might consider reading your book, what would you tell them to expect? D: Action, Adventure and Surprises. D: Talking about my book. Interacting with both other authors and readers. Passionately getting the word out to the world about me and my written work. Me: Yes, talking to people about your work can be a blast. Do you have a day job as well? Me: Lucky you! :-) What do your think the hardest and easiest parts about being a writer are? D: The hardest part is once the work has been published because as an indie author and publisher you then need to take care of marketing. The easiest part was for me building the story structure and basic character profiles. Me: Yep, the old marketing challenge. Every indie author's bane. ;-) What genre do you place your book in? Me: Two of my favorite genres! :-) Is there anything else you'd like to tell your readers? D: My research took me deep into many conspiracy theories which are still valid today. I was amazed at just how much literature and other media was available to me. With my chosen gentres of Fantasy and Sci-fi, I can take readers into such dystopic realms with characters ready to take on any situation. Me: And so all these fine people can explore those realms with you, are there any links you'd like me to post?